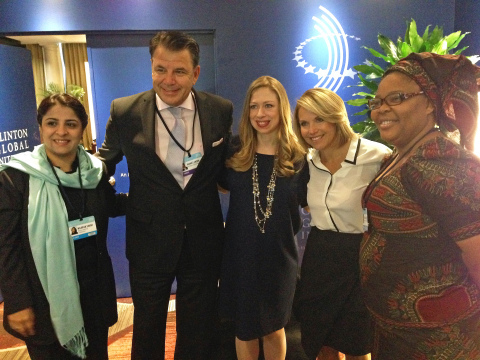 Western Union President and CEO Hikmet Ersek spoke today on women’s economic empowerment and equality at the 10th annual Clinton Global Initiative event in New York. The session was part of a series featuring Hillary Rodham Clinton, Former U.S. Secretary of State and U.S. Senator from New York; Melinda Gates, Co-chair and Trustee, Bill & Melinda Gates Foundation; and Shinzo Abe, the Prime Minister of Japan. Ersek’s panel, moderated by Katie Couric, featured Chelsea Clinton, Vice Chair, Clinton Foundation; Leymah Gbowee, Nobel Peace Prize Laureate, 2011, and President, Gbowee Peace Foundation Africa; and Nilofar Sakhi, CEO, American University of Afghanistan. During the panel, participants discussed accelerating the pace of positive change for girls and women around the world. The panel can be viewed at http://new.livestream.com/CGI/CGI2014/videos/62996756. Also at this year’s CGI, The Western Union Company (NYSE:WU) hosted a series of meetings and events, including a breakfast for nonprofit non-governmental organizations (NGOs) providing an update on the Western Union NGO Global Pay money-transfer service and products. NGO Global Pay is a financial platform designed to help NGOs bridge the gap between funds that need to be disbursed and the people who need them in the field. Today, numerous NGOs use Western Union Business Solutions to move their money and fulfill their missions. Western Union announced a commitment to develop and expand the NGO Global Pay service around the world at CGI in 2012. The Western Union Company (NYSE:WU) is a leader in global payment services. Together with its Vigo, Orlandi Valuta, Pago Facil and Western Union Business Solutions branded payment services, Western Union provides consumers and businesses with fast, reliable and convenient ways to send and receive money around the world, to send payments and to purchase money orders. As of June 30, 2014, the Western Union, Vigo and Orlandi Valuta branded services were offered through a combined network of over 500,000 agent locations in 200 countries and territories and over 100,000 ATMs. In 2013, The Western Union Company completed 242 million consumer-to-consumer transactions worldwide, moving $82 billion of principal between consumers, and 459 million business payments. For more information, visit www.westernunion.com.